The Year's Work in English Studies is an annual narrative bibliography which aims to cover all work of quality in English Studies for a given year. 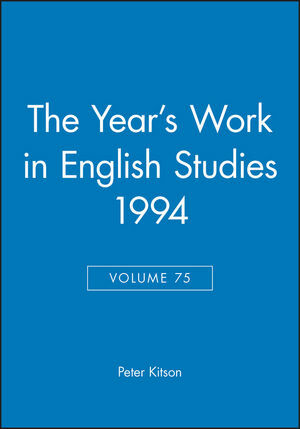 Volume 75 evaluates work published in 1994. Peter J. Kitson is Lecturer in English, specializing in Romantic literature, at the University of Wales Bangor. He is editor of Romantic Criticism 1800-1825 (1989) and Coleridge, Keats and Shelley (1995) and co-editor with T. N. Corns of Coleridge and the Armory of the Human Mind (1990). 5. The Sixteenth Century (excluding drama after 1550). 7. Renaissance Drama (excluding Shakespeare). 8. The Earlier Seventeenth Century (excluding drama). 10. The Later Seventeenth Century. 12. The Nineteenth Century: Romantic Period. 13. The Nineteenth Century: Victorian Period. 15. American Literature to 1990. 16. American Literature: The Twentieth Century. 17. New Literatures in English. Narrative reviews of work published in 1994.